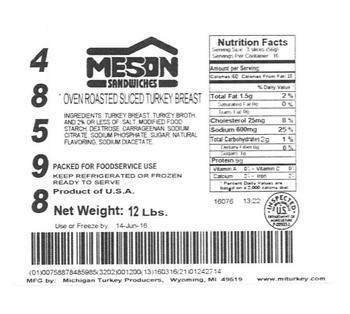 Michigan Turkey Producers of Grand Rapids, Mich., is recalling approximately 54,011 pounds of turkey breast products that may be contaminated with extraneous materials -- specifically an unidentified black material. There are no confirmed reports of injury or illness from consumption of these products. The recalled products, bearing establishment number “P-20935A” inside the USDA mark of inspection, were shipped to a distribution center in Florida and food services in Florida and Puerto Rico. Consumers with questions about the recall may contact Deborah Hein at (616) 245-2221, ext. 237.